This article has been buried for a long time. 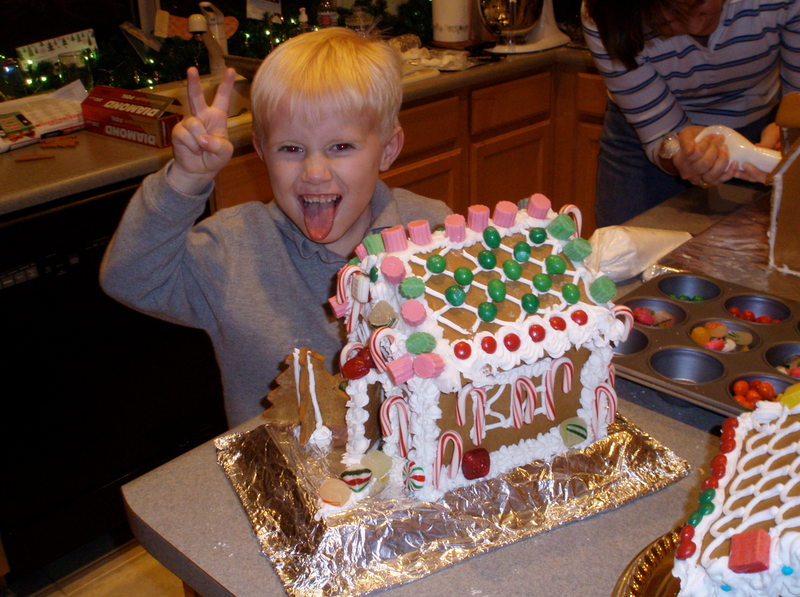 I thought maybe it was time to resurrect it with the holidays coming on. 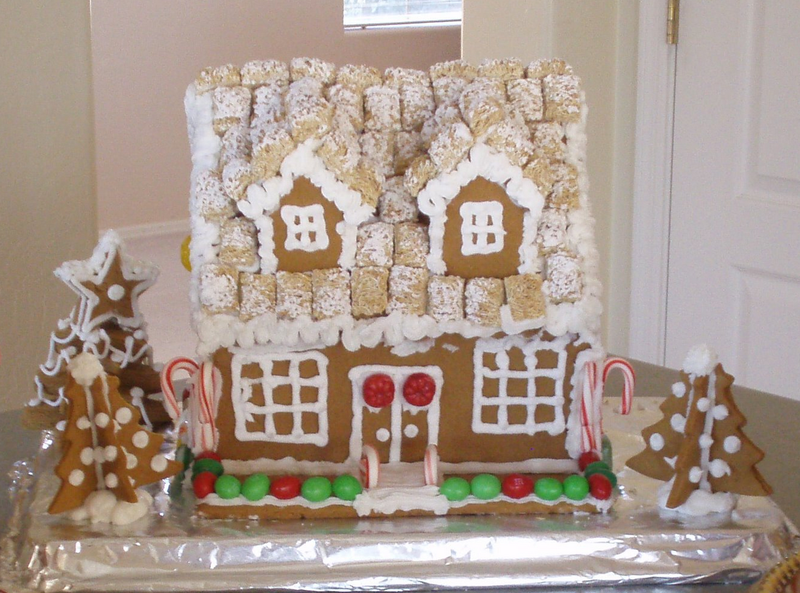 Don’t let yourself be intimidated to make a gingerbread house from scratch! I taught myself and every year we’ve had a smashing success. Maybe this year, I’ll update this one with some new pictures and creations – can’t believe this is already 7 years old! Where’d the time go? I found it in my Taste of Home magazine and it’s just plain awesome. It needs to sit in the fridge for a half hour to hour to make the dough more workable (less sticky) so leave some time for that. You can do it without that step, (I’ve done it before) but it requires the use of more flour and it was harder to get smooth without the chill time. However if you ask my 5 year old (he’s 12 now!!) it didn’t alter the taste one bit! In short, you just mix the first 4 ingredients together until creamy, mix the dry ingredients together first in a separate bowl and then slowly add it to the mixture. Bake at 350 degrees for 10-12 minutes or until edges are firm. if you are short 1/4-1/2 C of molasses, pour that much water into the jar and swirl it around until the jar is mostly clean and water is slightly thickened and flavored, pour it into your dough. The next step is rolling out the dough. 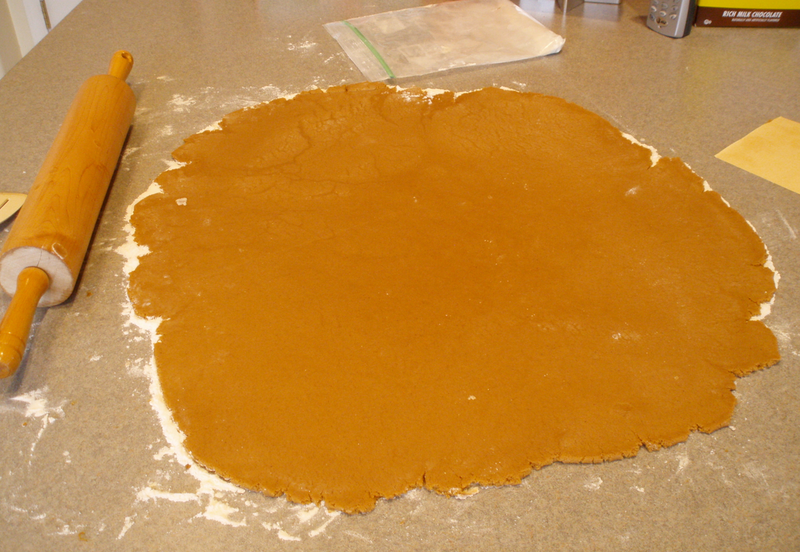 You need a flat surface lightly coated with flour and a big rolling pin. Most recipes suggest a thickness of about 1/4 inch. For cookies I like to leave the dough a little thicker (remember it will rise as it cooks) because it keeps the cookies softer. But for houses I roll mine a little thinner so it’s not so heavy and will dry faster. Remember to coat your rolling pin with some flour too to keep the dough from sticking and wrapping around it. 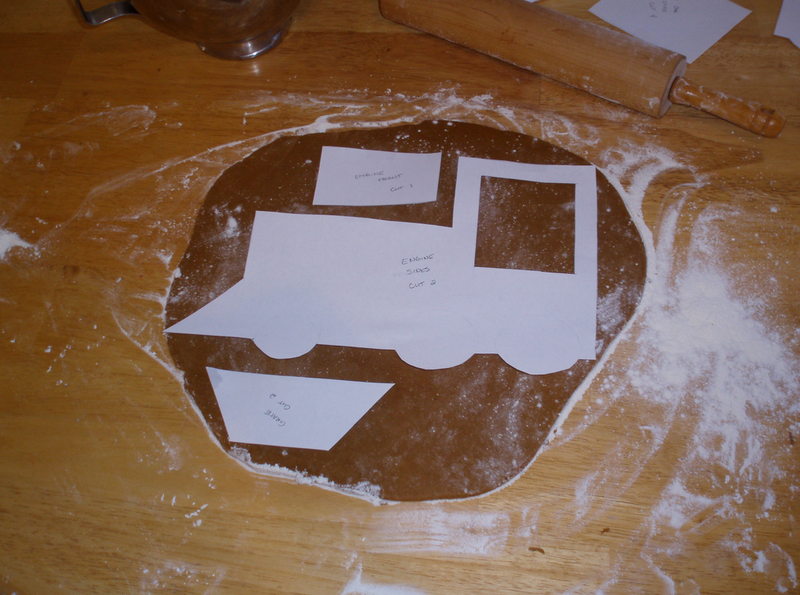 Once the dough is rolled out to the desired thickness you cut your patterns. If you’re doing cookies any cookie cutter will work. For houses I make my own pattern. You only need three basic pieces for a simple house: a front and back that is a square with a triangle top, a side that is a rectangle or square that matches the height of the front/back square, and a roof that is just a little larger than the side. Cut two of each and you have the makings for your house. 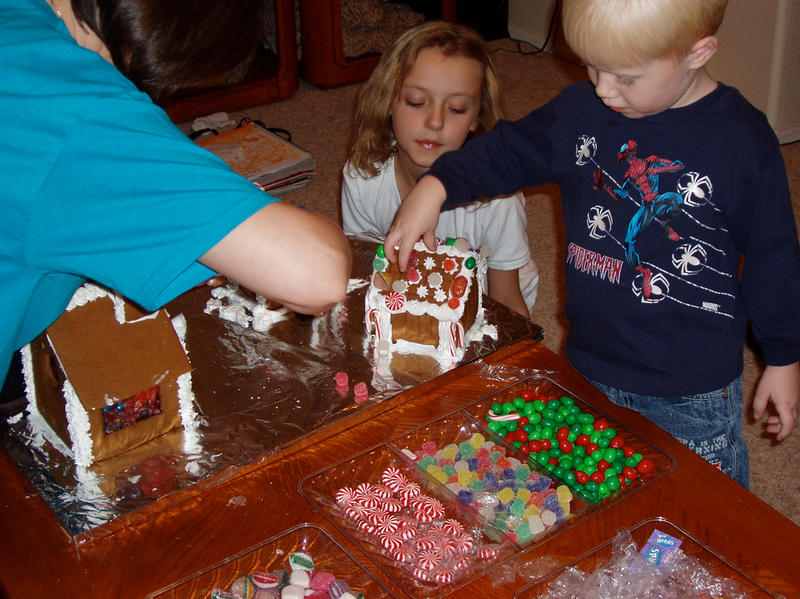 If you’re a little uncertain, just construct your house with paper first to make sure your pieces fit/work together. The roof needs to be a good 1/2 inch larger on all sides than the sides to ensure coverage once the pieces are put together. 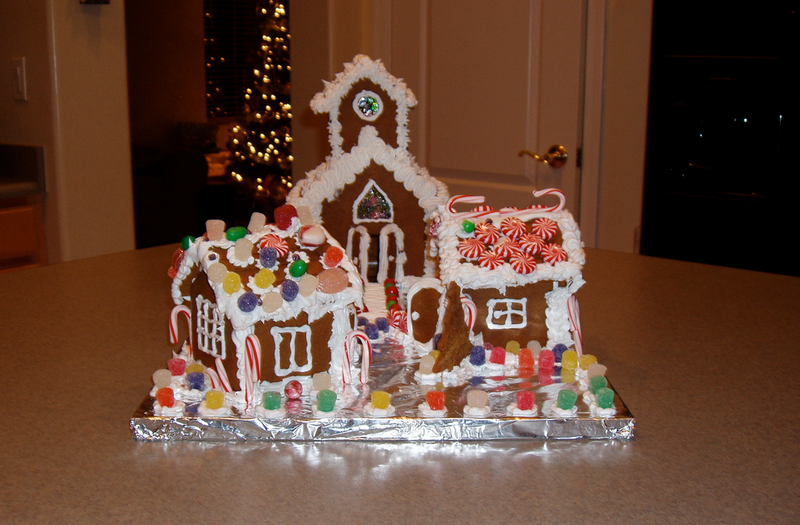 Last year I made my own pattern for a church and this year I made a taller two story style home. I just played with basic paper patterns to try new things. A house is a simple pattern of squares, rectangles and triangles. 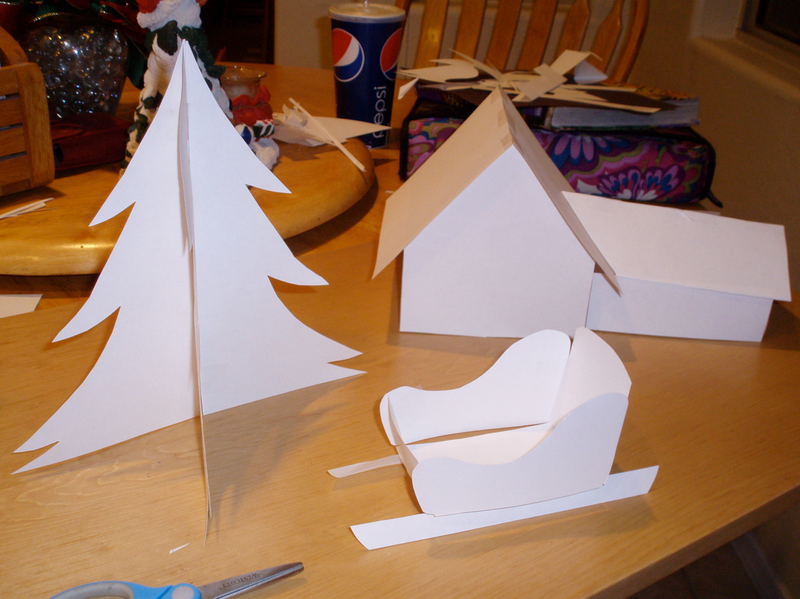 Put a triangle top one a square and cut out two to make the end pieces, and 4 rectangles for the sides and roof. The image below shows you what the pattern pieces look like. 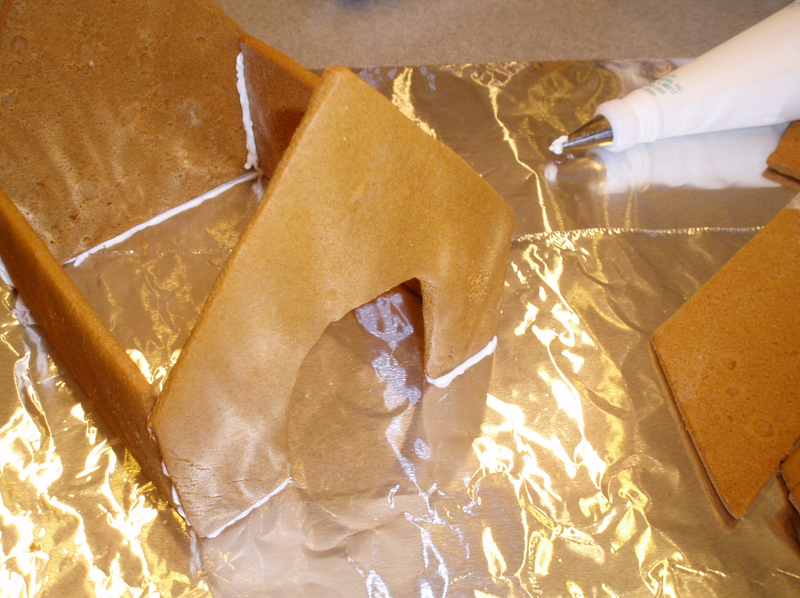 The walls have windows cut out and the small triangles glue together to make a little chimney. 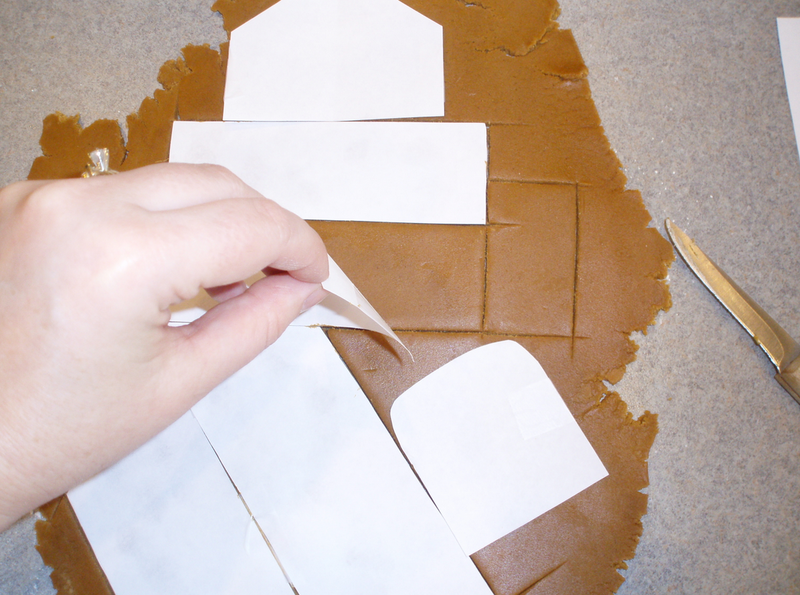 I cut my patterns out and then transfer them onto a cookie sheet. If you get easily frustrated moving the pieces then I suggest rolling the dough out on a piece of wax of foil paper so you can just lift the entire thing or even flip it over to drop the pieces onto a cooking sheet. When the pieces come out they will be puffy from cooking. If you’re a perfectionist you may want to use a sharp knife to cut around the edges making them straight. Between you and me, that’s the whole point of the frosting at all the seams and I rarely bother with it unless something really got distorted during cooking. 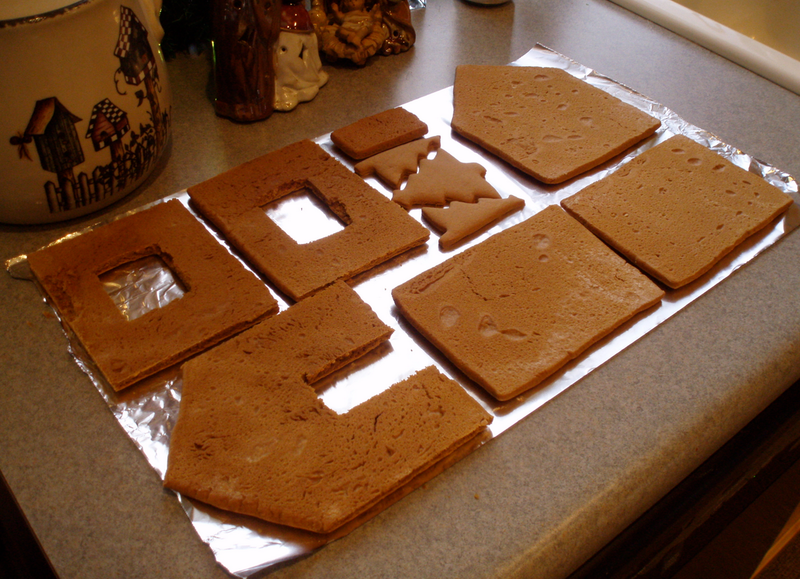 You can cut out doors and windows both before and/or after baking. Just make sure if you do it after baking you do it while the dough is still warm. Additionally, you can make small marks/outlines with a butter knife for windows or doors if freehand isn’t your thing. 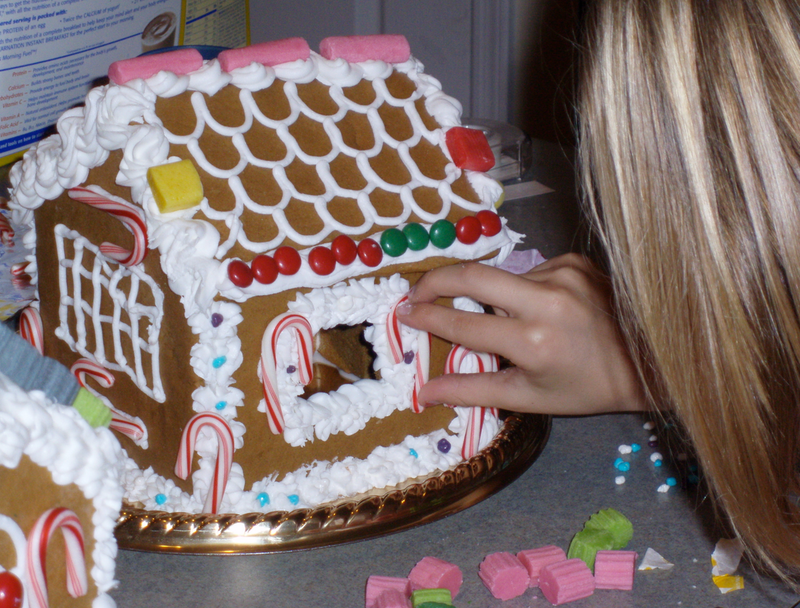 Then you can just trace over the marks with the icing. 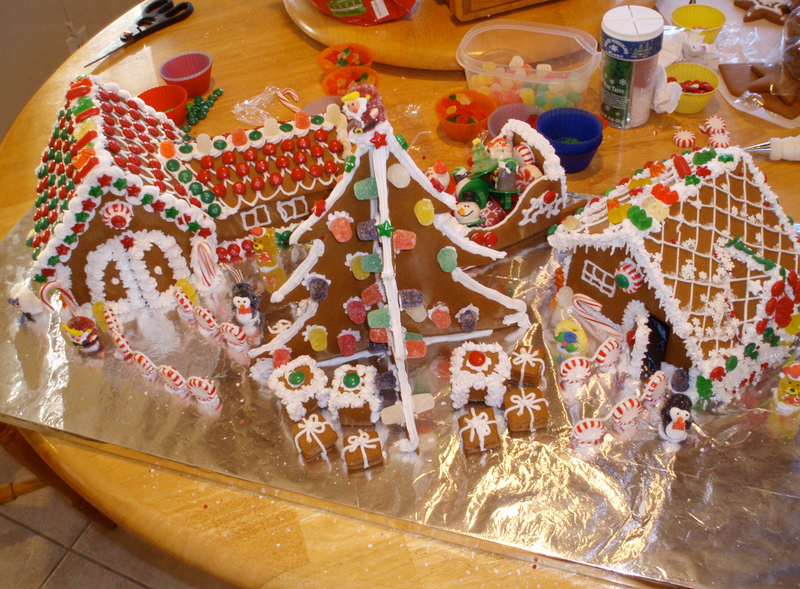 The gingerbread needs to be hard enough to stand without bending before you put the houses together. I’ve never had any fall apart but I’ve heard from plenty of people that experienced a cave in. Depending on thickness that can take a few hours to a full day. This year I cooked mine on Sunday and put them up Monday night. Last year I’m pretty sure I cooked them in the morning and put them together that same night. After they’ve cooled on a wire cooling rack I place them on foil face down allowing more drying through the backsides. Another fun thing was to make stained glass windows. Simply break a hard candy or sucker into small pieces and put it in the cutout window section. 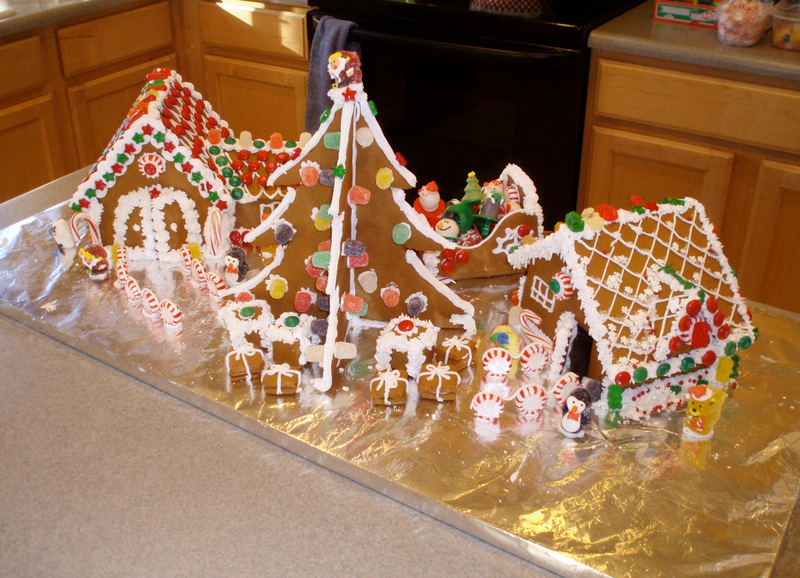 Heat it in the oven for a few minutes – just until the candy melts. The pieces melt into a beautiful stained glass form. I put it on some foil for easy removal once it cools. 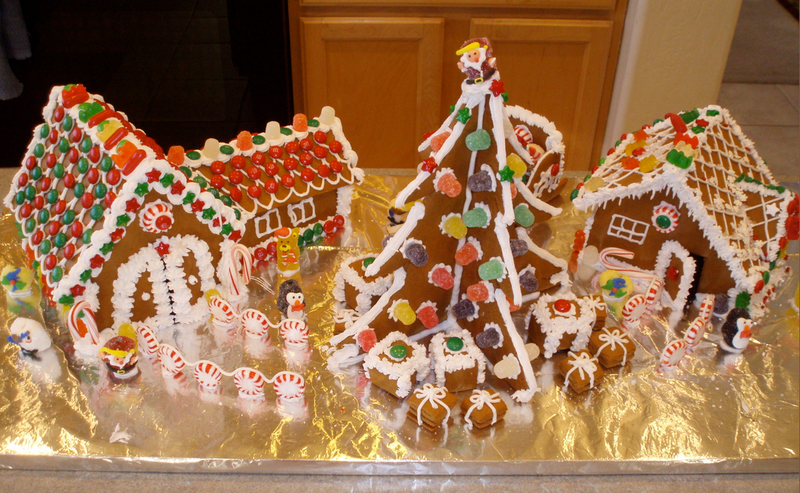 I’ve also made gingerbread evergreen trees. This year’s pictures show both styles. 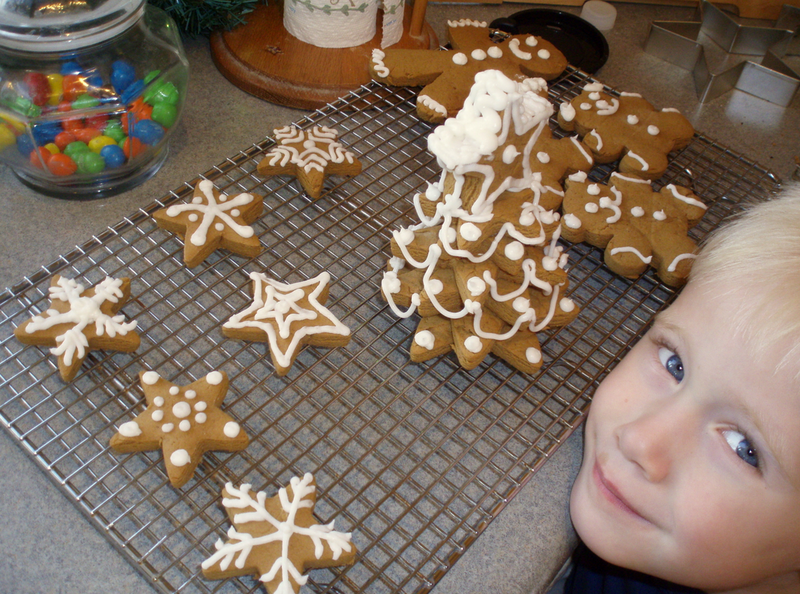 One used 2-3 sizes of star cookies rotated and placed on top of one another to form a tree. The other I used a tree cookie cutter making two. I cut the second one down the middle before cooking. Then I iced the two half pieces to either side of the full tree and it looked like a 3D tree. 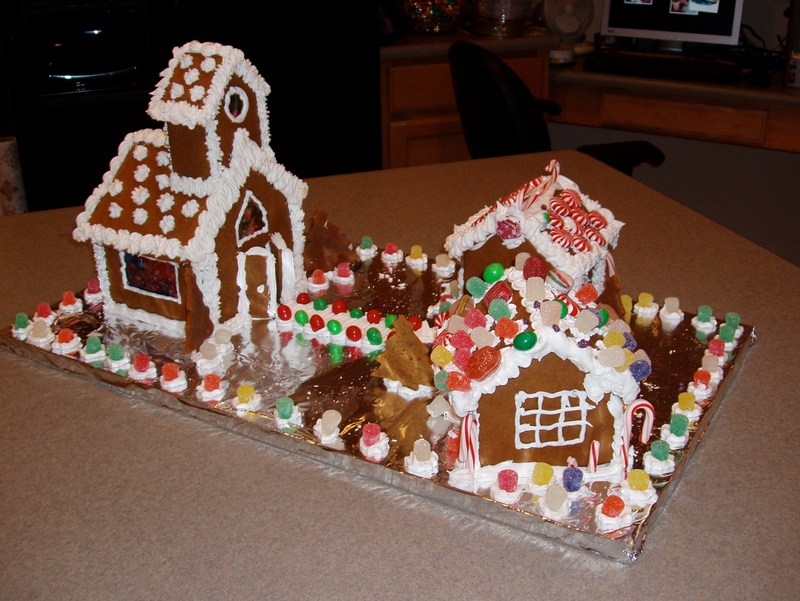 Some people make special sugar syrup mixtures for gluing their gingerbread house pieces together. I’m too lazy. 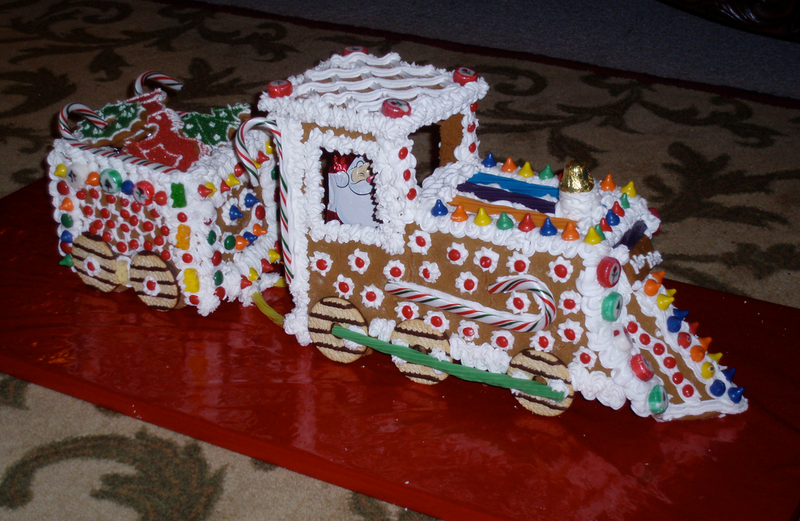 *snort* I just make simple royal icing. That’s just powdered sugar with a little water. I mix the two until it turns into a thick consistency. It holds and sets quickly and I’ve never had a problem with anything falling apart. I use disposable icing bags that you can buy in bulk at a craft store. Just cut the ends a drop the tip you want in, push it into place and fill the bag. One helpful tip in filling the bag is to fold it over your hand while holding the base as it will make it easier and keep frosting from getting all over the edge of the bag. 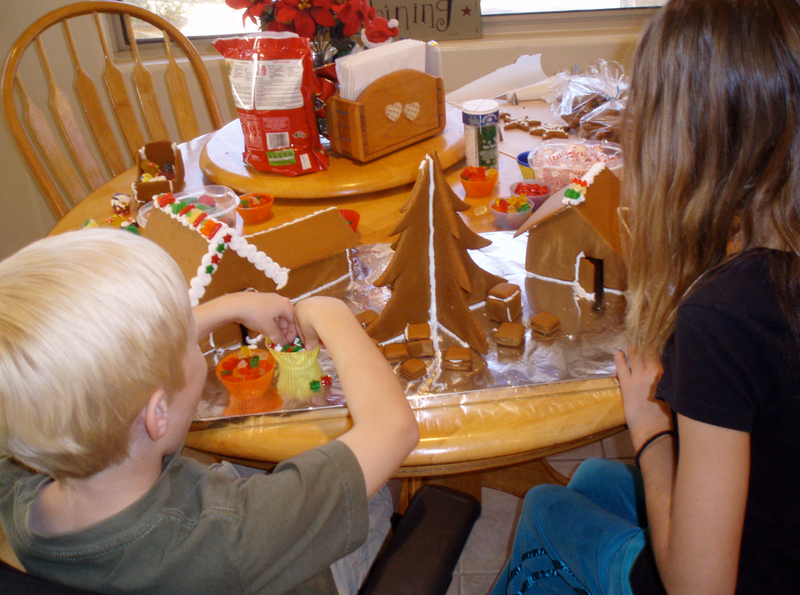 The only two tips you need for a gingerbread house are a star tip for ruffles and stars and a round tip for piping and gluing. 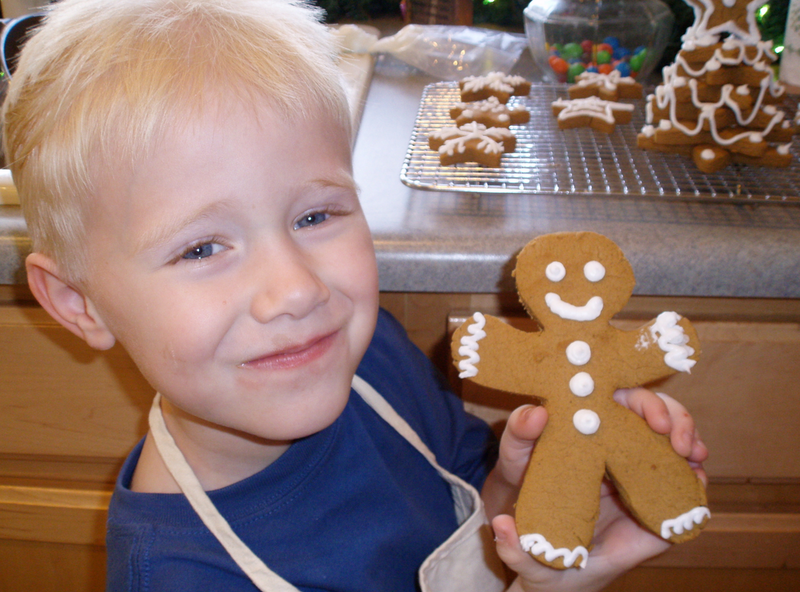 For decorating, the plain royal icing needs modification. Otherwise it will be too stiff and won’t hold a shape resulting in a great deal of frustration. Just add some shortening and flavoring (like vanilla or butter) and it will fix that. I use about 1 C of shortening, 1 tsp of flavor (optional), 4 C powdered sugar and a little water. Your elevation has so much to do with the consistency that I’d start with a couple tablespoons of water and add more slowly until you reach the desired consistency. On this last round I just added some shortening and flavor to my royal icing until I got the consistency I could work with. 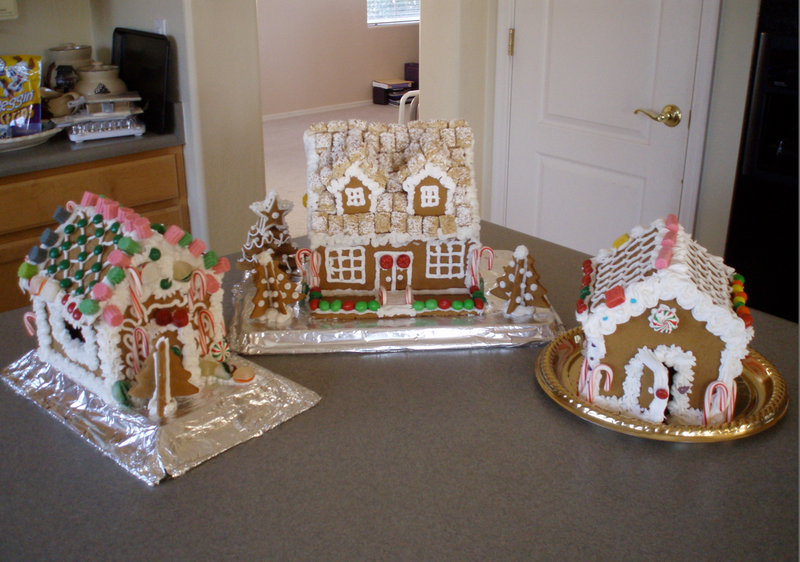 This year I doubled the batch of gingerbread and it made the three houses. 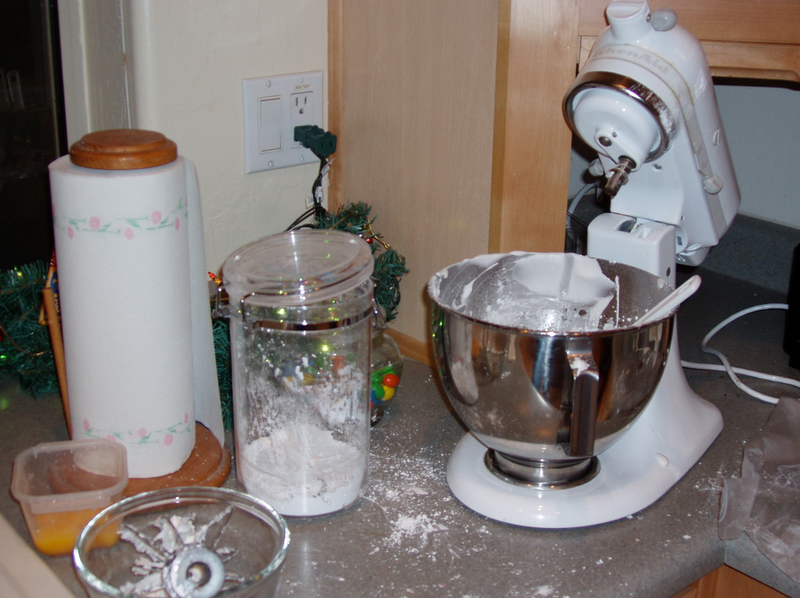 1 1/2 bags (2LB size) of powdered sugar did frosting for everything and I had plenty left over too.